World Cup Ratings Spike: How Popular Is Soccer In The U.S.? : The Two-Way Sunday's U.S.-Portugal match drew an average of 24.7 million viewers, according to Nielsen, ratings that put the game above the decisive Game 5 of the recent NBA finals. World Cup Ratings Spike: How Popular Is Soccer In The U.S.? 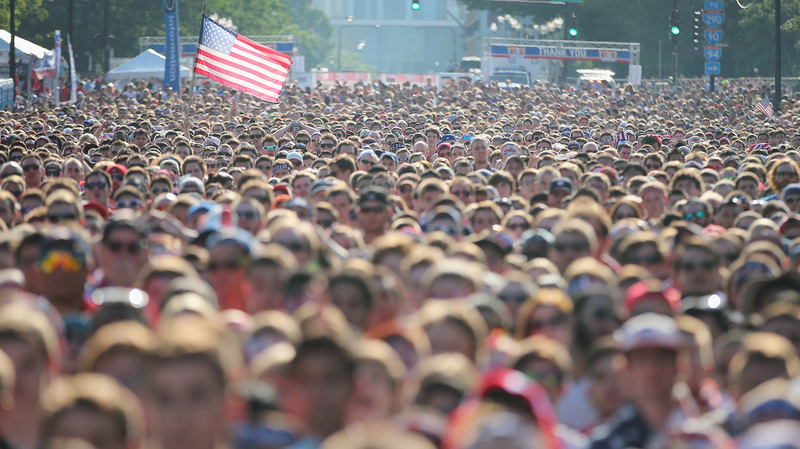 Fans gather in Chicago's Grant Park to watch the U.S. play Portugal Sunday — a game that set a new ratings record for soccer on ESPN. Sunday's thrilling and frustrating World Cup match between the U.S. and Portugal drew an average of 24.7 million viewers, according to the Nielsen ratings company, a result that puts the game above the recent NBA finals. The game's total U.S. viewership of 24.7 million includes ratings from both ESPN (18.2 million viewers) and the Spanish-language Univision (6.5 million); it doesn't include the 1.37 million people ESPN says streamed the game online. How Popular Is Soccer In the U.S.? The ratings also don't take into account the thousands who watched the U.S-Portugal game, which ended in a dramatic 2-2 draw, at large outdoor viewing parties. "While not near the totals scored by the N.F.L. playoffs or, certainly, the Super Bowl, the American audience for the World Cup game on Sunday easily eclipsed the N.B.A. finals this year, which averaged 15.5 million viewers, as well as the 2013 World Series, which averaged 14.9 million viewers. The N.H.L. playoffs are not even remotely as popular as the World Cup, having averaged only five million viewers this season." The strong ratings were greeted as affirmation by soccer fans in the U.S., with some folks seeing proof that the game's future is golden here. The TV numbers back up recent reports that outside of host Brazil, far more World Cup tickets were bought by Americans than any other nationality. So, where are the soccer fans in the U.S.? While the Washington, D.C., market has led the way in English-language broadcasts, the Cup also highlights the power of Univision, which holds the Spanish-language rights in the U.S. Consider that in Miami, the U.S.-Portugal game drew a 9.4 rating on ESPN — and a 10.7 rating on Univision. That combines for a combined rating of 20.1 — surpassing Washington's combined mark of 17.2 (13.3 on ESPN and 3.9 on Univision). Univision says that its ratings for this World Cup have already beaten the totals from 2010. Others are taking the ratings with a grain of salt, noting that the homegrown Major League Soccer's games have struggled to command viewers' attention. We'll also note that while the World Cup draws fans who love the sport, some viewers' interests are driven by nationalist passions. There's also the high level of play. And then there's the timing: Of the major U.S. sports, only baseball is now in season. That leaves plenty of room for the Cup in many sports fans' lives. "Through 32 matches, World Cup games averaged 4.3 million viewers on ESPN. That's up 50 percent from the nearly 2.9 million for matches in the 2010 World Cup. Sunday's match was the most-watched event ever on ESPN that did not involve American football." The strong ratings benefited from a favorable viewing time: 6 p.m. ET on a Sunday. In more ways than one, the next U.S. game should pose more of a challenge: It starts at noon on Thursday, and it's against Germany. It will also decide whether the U.S. team advances to the tournament's round of 16. As Eyder explained in a Two-Way post yesterday, there are several scenarios that could play out to determine who advances from group play, depending on the outcomes of the U.S.-Germany match and the simultaneous one between Portugal and Ghana.